Nose: Peaty, and salty. Damp earth, and very slightly floral. Not as peaty as you’d expect. Quite clean, and not overly complicated on the nose. Palate: Straight up front you are absolutely belted with peat and cereal notes. Sledgehammer to the tastebuds time. After the sledgehammer is put away you get notes of ocean spray, bushfire smoke, and fresh tar. Faint notes of vanilla and dried apple, but also a decent dose of pepper. There’s the tiniest trace of the dust that is left at the bottom of a bowl of beer nuts. The peat lingers across the entire palate, from the initial blows right through to the end. Mouthfeel: Thick and oily. A decent whack of alcohol burn up front, but that dies off pretty quickly. Finish: The finish lingers for some time, but is not what I’d call a long finish – definitely on the meaty end of mid-weight. Lots of damp earthy peat, and plenty of salty brine. The faint notes of vanilla continue on from the palate, but are even more subdued. Balance: Sweet and spicy, fruity and salty, honey and tonnes of smoke. This whisky is a study in contradictions, and really should be a complete mess – yet somehow walks that fine line to pull off a well-balanced whisky that just grows and grows the more you sip it. The fifth release of Octomore (the second series had two releases – 2.1, and 2.2) was aged for 5 years in ex-Bourbon barrels in Bruichladdich’s warehouses on the west coast of Islay, and was bottled at 62.5%ABV. It was peated to a mammoth 167ppm and bottled, as always, with no chill-filtration, and no colouring. My goodness me – if Bruichladdich’s Octomore series is the iron fist in the velvet glove, the 4.1 is carrying a sledgehammer in that iron fist for introductions, before it puts it down and strokes you with that velvet glove. 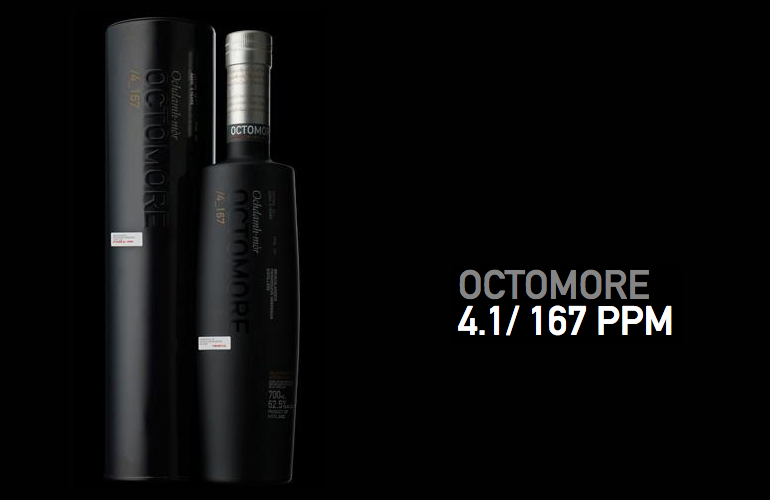 Octomore 4.1 is big and bold, yet also smooth and contained – it feels like at any moment it is about to burst out of its skin in an explosion that would rattle your teeth; and it does indeed seem to grow bigger and bigger the longer you sip it, but unfortunately the whisky runs out before any explosions occur. This is the Octomore where you really feel that Bruichladdich has figured the basics out in regards to Octomore – it’s big, it’s bold, it’s smokey as all hell, yet it’s also got good balance and nice flavours, and is starting to be just that bit refined despite its size. One thing we know for sure is that Bruichladdich seemed to take note that they were on the right track after this release, but never took the foot off the accelerator. If you can snag yourself a dram (or a bottle) of this delicious whisky, I highly recommend you do so. It’ll unlikely be easy, and it’ll even less likely be cheap, but it will definitely be worth it.